Ponder a bridge, a beautiful bridge, one that takes you from one lovely place to another. Picture your journey, leaving one side and entering someplace new, someplace wonderful, and the bridge, which can be easily forgotten (but shouldn't), is how you arrive. Bridges are important, they make transitions easier, they pace out life, allowing you to look behind, while guiding you forward. They propel you to a new future, giving you time to reflect on the past and gather your senses for a new adventure. Okay, this is a rather spectacular bridge, but if we are to dream, why not dream big? Summer to autumn, not always an easy transition, we drag our feet from flip-flops into shoes and socks, out of shorts and into jeans, the green leaves take on color and the nights become cool. Here is a soup that can make this change a little bit easier, it has the taste of summer with the warmth of fall, and just invites you to walk to the other side with open arms (and mouths). Warm and filling with just a taste of summer. This recipe, from the inspiring Dorie Greenspan, never fails to make me happy, it's easy, quick and so good. You really should give it a try, I don't think you'll be disappointed, it has the flavors of summer with the warmth of fall, a perfect soup to bridge the seasons. 1 teaspoon of chopped fresh ginger- do not leave this out! Grated zest of one lemon- again, do not leave this out! Mix all of the above- except the broth, lightly in a bowl (use your hands to gently combine all the ingredients)- set aside. It's best to add the meat last. Next, bring the chicken broth to a light boil in a large pot, I use a dutch oven type pan, but you can use whatever you have on hand- just make sure it's rather large. Turn the broth down to a slow bubble and form the meatball mixture into balls about the size of golf balls. Drop them gently into the pot of broth (use a large spoon) and let them simmer for about 10 minutes. You may need to do the meatballs in two batches. After 10 minutes, take the meatballs out and put them into a bowl. 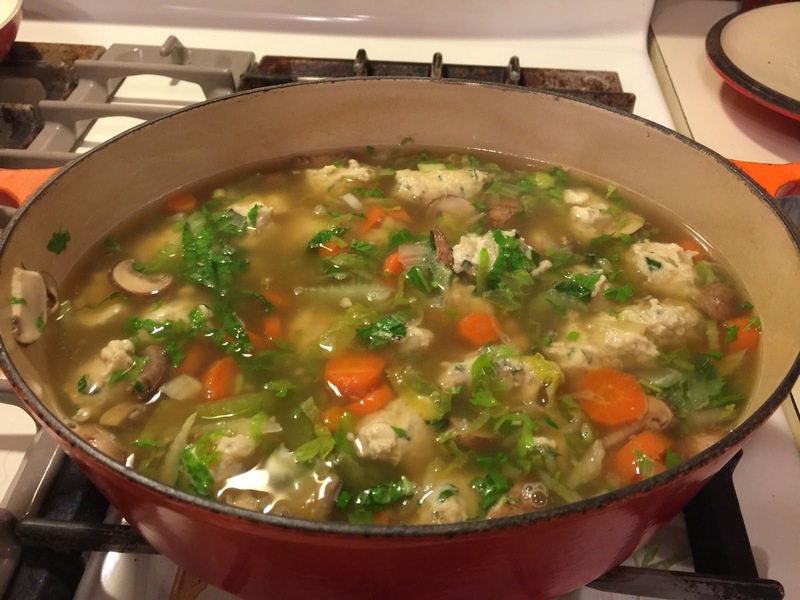 Set the meatballs aside, and save the broth. For the next step-In a separate pot, cook half a package of egg noodles- you can use any type of noodles, but I prefer egg noodles. This step is really important, as when you cook the noodles separately, they don't soak up all the broth when you finally combine the whole soup. Drain noodles and reserve for last step. And for the last step-Bring the broth to a light simmer, and add about 4 cups of vegetables- I like to add celery, carrot, a bit of savoy cabbage and green peas, green beans are nice, too. You can add whatever you'd like- just make sure the vegetables are chopped finely enough to cook rather quickly. After a few minutes of cooking the vegetables, add the meatballs and the noodles, let it all heat through, about 5 minutes. Turn the heat off, serve and enjoy this culinary bridge from summer to autumn.